Welcome to the incredibly fascinating world of Shree Gajanan Paper & Boards Pvt. 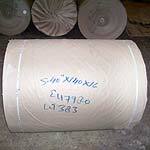 Ltd.. We are involved in manufacturing and supplying optimum quality M.G kraft Paper. Our company has established its image in the market as best quality M.G Kraft Paper, Manufacturers . Our company believes that the future competition would be on the basis of buyerâ��s service. So we are committed for providing 100% satisfaction to our customers. In our company the production and quality control procedures are carried out by qualified and experienced personnel. We are committed to achieve and maintain new heights by continuously improving the quality of our M.G.Kraft Paper. We have an unconditional love to meet our customer's stated and implied needs. M.G.Kraft Paper We are planning to enhance our company's production capacity to meet the bulk requirements of our customers. We are also planning to export our M.G.Kraft Paper,USA and UK. Our products are available in the form of reels and are very useful for Corrugated Boxes, Liners, Textile Tubes, Duplex Cartons etc. Last but not the least, we believe in building long term healthy relations with our customers. © Copyright 2009 - 2010. Shree Gajanan Paper & Boards Pvt. Ltd.